Living independently is a luxury many of us enjoy even into our later years. Of course the freedom of living at home does come with several possible risks, which are even more pronounced as we age. However, there are many ways to add safety features to your home and to prepare for any potential accidents. 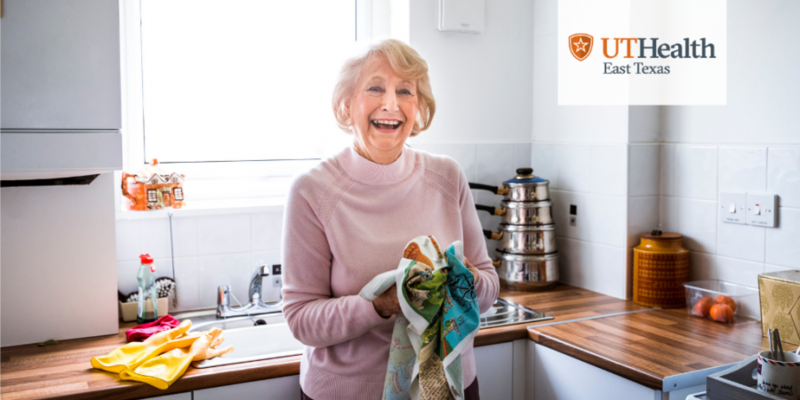 If you are a senior living at home or have a loved one who is, follow these tips to create a safe environment throughout the whole home. Keeping rooms and walkways well-lit is a big part of home safety. For rooms, make sure you have a way to turn on a light as soon as you enter (instead having to turn on a lamp halfway across the room). Have overhead lights in hallways and over staircases so you can see where you are walking. If possible, install light switches at both ends of the hallway. Put nightlights in every room, especially the bathroom. Add a lamp by your bed in case you need to get up while it’s dark. One of the most common places for household accidents is in the bathroom. Slippery surfaces cause falls and result in injuries. You can prevent these spills by adding a few safety features. The tub and shower can be a source of anxiety if you have trouble balancing or standing. Take confident steps by adding a nonslip mat to the base of the tub or shower. You can also buy a chair that’s meant to be placed in the tub. To sturdy yourself while you step out of the tub, install a railing or balance pole nearby. Use liquid soap so you don’t have to worry about dropping bars. Install a lock that can be opened from the outside in case someone needs to help you. Add nightlights for those evening visits. Set the hot-water heater thermostat no higher than 120 degrees to avoid burns. Dry your feet before stepping out of the tub. The kitchen can be a high-energy place with several things going on at once. Adapt your space to make sure you avoid any burns or other mishaps. Check your appliance wiring or have someone do it for you. Mark on/off switches clearly. If these markings are hard to read, try adding green and red stickers to areas such as the stovetop knobs. Rearrange your cabinets so that the heavier objects are at chest height or below. If you take more than one medication or you share your home with someone else who also takes medication, it’s important to keep them separate. Ask your pharmacist to print large labels if you find them hard to read. Keep the pills in the container so you don’t mix them up. Bring the pill bottles to your appointments, as well as any written log you are keeping, to share with your physician. There are many factors that could lead to a fall – lack of strength, tripping, dizziness from medication, confusion and/or sleepiness. There are several lifestyle changes and home changes you can make that make it less likely you will fall at home or anywhere else. In addition to keeping areas well-lit, you should make sure the floor is clear of obstacles like wires, clutter and unstable rugs. If you have to walk around furniture all the time, try arranging it so you have clear, straight walkways. Add a mat below rugs so they stay in place. Add bright tape to the edge of stairs if light is not enough. Wear non-slip shoes around the house and don’t get up quickly to grab the phone, but instead, carry a cordless phone or cell phone with you. A phone is also good to have on-hand if you happen to fall and need assistance. Another way to prevent falls is to stay active. Exercise can improve your strength and balance. You should also discuss your medications with your physician if they cause drowsiness or dizziness. If an accident does happen, it’s vital to keep important numbers on-hand. In addition to your close family members, friends and/or neighbors, you should program emergency numbers into your phone as well. To find a UT Health physician and make an appointment, please call 903-531-8890.